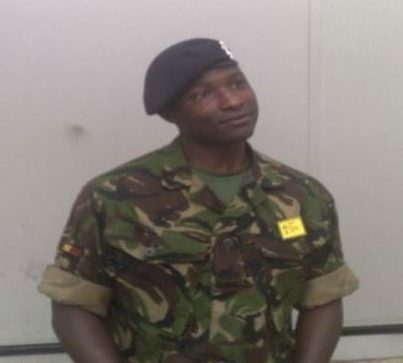 A soldier fell to his death from a three-storey block trying to catch his mobile phone as he made a call to his girlfriend, an inquest heard. Lance Corporal Nicholas Githaiga, 32, was at the window smoking a cigarette when the device fell from his hand as he chatted to a friend. He plunged to his death after desperately trying to grab hold of it, Southwark Coroner’s Court heard. A neighbour found him in a pool of blood and heard the frantic calls of girlfriend Eva Muthoni on the still functioning phone. Based in Germany, L Cpl Githaiga was due for a medical discharge from the army and had been suffering from stress. Girlfriend Eva Muthoni, had been on the phone to L Cpl Githaiga at the time of his death. Eva, who lives in South Africa, said: ‘He was a very happy person. The father of two had been married but his wife Danielle had tried to have him arrested for drink driving. Daniella Pigurs, complained to German police that Nicholas had been drink driving but the charges were not followed up. Eva Muthoni added: ‘Daniella had been trying to get him arrested for drink driving. He was worried and wanted to go and see his family. He explained to me that he was going through divorce proceedings. ‘We were on loudspeaker, so I could hear him. Then there was a small bang. I repeatedly called his name but there was silence. L Cpl Githaiga lived in an apartment block in Versmold, Germany, with his friends. No members of his family appeared at the inquest into his death. ‘I wanted to go to bed and sleep. Nicholas was meant to sleep on the sofa. ‘I was in the bathroom, and Nicholas knocked on the door. I let him smoke in there, because all the other flatmates were none smokers. He was on the phone and I spoke to Eva to say hello. ‘During the night, I received a knock the door from a neighbour. ‘I was told Nicholas was lying on the ground. I ran outside, and people were already around Nicholas. ‘We had planned to arrange a surprise party for him because he was leaving the army. Coroner Julian Morris said: ‘On 18 June 2017, Nicholas Githaiga, who had been drinking died. He fell from a window. He was at the window to smoke a cigarette and he was on the phone at the time. ‘It is clear that he dropped the phone and fell trying to recover it. He died from head and chest injuries sustain from the fall.